A common challenge facing students who seek to do masters is finding the right school/university based on their GRE score, GPA and TOEFL. For international students who want to pursue MS in US universities , it is relatively tough as they have to convert their scores into 4 GPA based on US standards. Here is a guide on GPA. CollegeHippo has been trying to assist students in find the right school. We have admission statistics of 500+ US universities and graduate schools and based on your GRE score we have come with a scale Tough , Medium and Easy which will help you find the right US university. To find the Graduate school program, it is very easy to get started. Choose a field of study and select the specialization. Fro example if you have selected Engineering, then select the specialization. After you have entered your GRE score and other details, press Find and you will see the results in 4 different categories. The results are sorted based on US news ranking and you can click on any result column to re sort them.Remember that this categorization is based on the scores aggregated from the universities websites, and in no way should be taken as the final advice. Tough: Based on your score and university admission statistics, US universities would fall under tough category for you. Medium: Based on university admission statistics and your GRE scores and GPA, these US universities would not be very difficult to get admission. Easy: These US universities are relatively easy to get admission. No minimum score: There are few master universities which have not mentioned minimum GRE scores. Admission is decided based on the application package, scores, GPA, work experience, extra curricular activities. 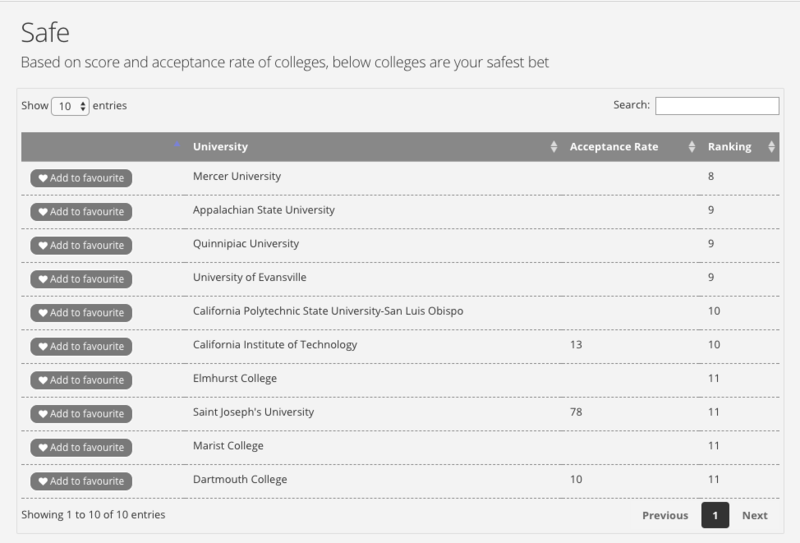 Acceptance rate is another important criteria. Even if your profile evaluation results categorize university under Medium or Easy, admission is always tough in top ranked universities like Colombia, Harvard or Stanford. How do I shortlist the best US universities based on my GRE score ? Go to the page below, fill out your details and get the universities based on your gre score. Anyone with GRE score of 340 for fall 19? Has anyone scored 340 in GRE ? Which are some good universities that I should apply for MS in MIS ( Fall 19). Internship : 1 year in private company as an IT Analyst. 3 extracurricular courses : Web programming , R programing , iOS basics. 1 project on machine learning. sorry on not giving a reply, but by now im sure you would have shortlisted or got admits. im also interested in mis course, and im preparing for gre(fall 20), my GPA is 7.03. what univ. will i get? pls let me know . thank you if you respond to my mail. Undergraduate college : Not a renowned one. PG Diploma from CDAC ACTS, Pune in wireless and mobile computing. Total 9 years of work experience as a software developer in networking domain. • Received “Departmental spotlight award” for solving the problem for one of the key customer of Juniper Networks. • Developed a feature which got 20million USD deal for the company. • I am certified Level-1 Power Yoga Teacher. Have taken yoga classes at local yoga center. • Took initiative to raise fund to get the toilets constructed for girls in a local school. • Love outdoor sports. Play basketball, pool table, badminton etc. • Always appreciate any kind of artwork. I do sketch and oil paint. No international exposure but I have been to 38 cities in 14 states of India across it’s length and breadth for education, work, leisure and adventures trip. • To go in Product management or Marketing. Aiming for : Top 25 MBA College. Would request you to evaluate my profile and suggest the college I should target with this aim and profile. Please suggest if I can go for executive MBA with current profile. If yes, then which college. Executive MBA is mostly in Europe. Can you please evaluate my profile? Extra curriculars – Writer at a Tech website (The Tech Portal) and I run my own blog. I want to study masters (computer science)in USA. Can you suggest me the universities which I can apply..
Will I get assistantship and stipend? Is my profile can be accepted in any universities in US for MS Agricultural Business and Management? What will be profile evaluation for MS Bioengineering in US base on below scores? Kindly check what universities my score can be accepted. If possible somewhere in Colorado. Can you please provide information if my profile is suitable for any 3 to 5 star universities in California? 1 Internships in IT at Singapore. please tell me is my profile suitable for stanford, harvard, ETH Zurich, TU Delft, EPFL, UCB, RIce, Purdue, Cornell? 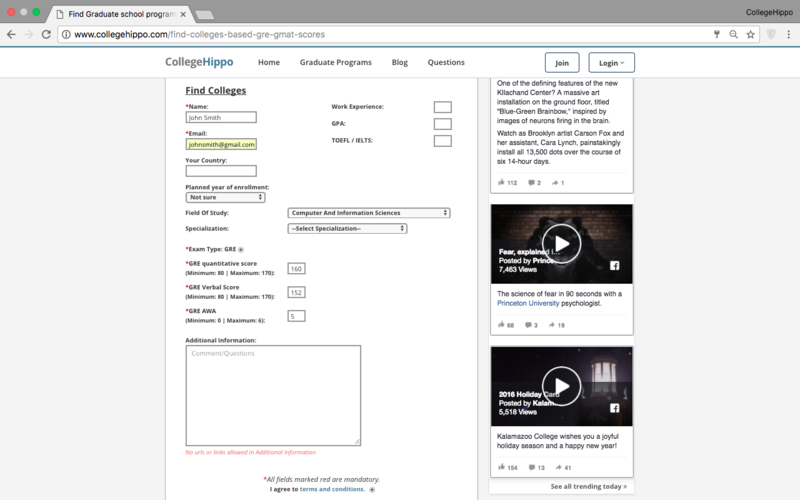 @Vishes check out profile evaluation from this page https://www.collegehippo.com/find-colleges-based-gre-gmat-scores . My advice, be realistic about colleges you are applying. All these colleges have low acceptance rate. What will be profile evaluation for MS Computer Engineering in US base on below scores? What university offer scholarship program? Is there a student loan program, like study now pay later? I am interested for MS Computer Engineering. How I can have profile evaluation? What will be profile evaluation for MS in US in biomedical engineering with following scores?